Unwanted body hair can be a complete hassle. If you’re tired of constantly having to shave or wax, permanent hair reduction may be a great option for you. Whether you want to rid yourself of daily shaving to remove facial hair, leg hair, or other body hair, Colorado Laser Spa has the perfect solution for permanent hair reduction using intense pulsed light (IPL) laser treatment. 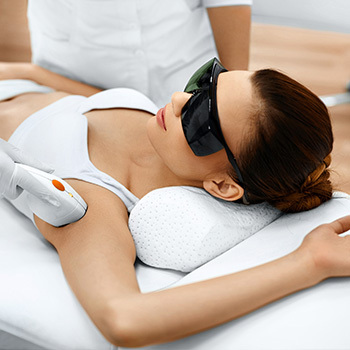 Unlike other laser hair removal, the IPL laser uses broad spectrum high-intensity light that emits multiple wavelengths of light to reduce hair growth. The strong light quickly destroys the root of the hair so you don’t have to worry about it growing back. With IPL laser treatments, our experienced and trained staff are able to precisely apply light to affect only the hair root and not the skin. IPL is a highly effective means of hair reduction but does require several treatments to achieve optimal results. The good news is IPL is less expensive than some other methods of hair reduction. The total cost of treatment to achieve your hair removal goals will depend upon how many treatments you require and which areas you are treating. We also recommend an annual maintenance treatment to keep your skin smooth throughout the year. Say goodbye to constant shaving, repeated waxing, and tedious electrolysis. You can experience the freedom of permanent hair reduction on your face, legs, and other areas with the technology of broad spectrum light through our IPL laser treatment. At our med spa, you’ll leave looking and feeling great, contributing to your total wellness. Now’s the time to choose consistently smooth skin with permanent hair removal.